AS Christianity’s demographic center of gravity shifts from the West to Asia and Africa, Third World Christians increasingly regard the secular West as a field for mission and ministry. A Nigerian nun passes out evangelistic literature in Harvard Square. An Indian (Telugu) Methodist minister delivers the opening benediction at a Fourth of July parade in Rosemont, Pennsylvania, a typical American suburb. London’s largest church, Kingsway United Christian Center, is mainly Nigerian rather than British. Third World Christians are having a significant, although still insufficiently understood, impact on the West. As various Third World cultures and religious practices meet and interact over time within different strata of Western culture, history predicts that the outcome will be determined as much by indigenous as by imported cultural and religious preferences. As we have seen in previous articles, the history of Christianity in India was not a simple tale of one-way Western impact upon a heathen culture. Instead, Indian Christians were highly selective in what they chose to adopt from American and European missionaries. They were also discriminating in choosing which cultural elements to retain from their pre-Christian heritage, much to the dismay of many Western missionaries who were promoting greater “indigenization.” The resulting Indian Christian cultural and religious idioms emerged not only from interactions between missionaries and Indian converts, but also between Indian castes (jatis), language/regional groups, and non-Christian religions. Indian Christianity is now as complex as the subcontinent into which this already varied and multi-denominational religion was introduced. Roughly 80% of all Indian Christians hailed not from the upper castes of Pandita Ramabai, Nehemiah Goreh, and N. V. Tilak, but from the so-called “depressed” classes—the untouchables or outcastes. The life and ministry of South Asia’s great Christian leader, Bishop Vedanayagam Samuel Azariah (1874–1945), illustrates the complex issues surrounding Indian converts’ relation to their indigenous Hindu-Muslim culture. His father was a convert from the semi-untouchable Shanar caste, whose turn to Christianity was part of the caste’s broader upward mobilization into the now influential modern Nadar caste. Attracted by Christianity’s commitment to transcending caste prejudices and divisions, Azariah created India’s first indigenous missionary societies in 1903 and 1905 and served as the first Indian bishop of the Anglican Church from 1912 until his death on the eve of Indian Independence. His life and ministry provide a window on the ambivalence outcaste Christians felt toward indigenization within local cultural systems that had oppressed them but from which they still desired respect and acceptance. Azariah left his Tamil roots in 1909 to go as a missionary to Telugu-speaking regions of the Nizam’s Dominions and the Madras Presidency, where he subsequently led some of 20th-century India’s most successful depressed class and non-Brahman conversion movements to Christianity. The total Anglican Christian population in his Telugu-speaking Dornakal Diocese increased from 56,681 in 1912 to 225,080 in 1941, a number that exceeded the total number of Anglican converts for all of Japan, Korea, and China combined. In 1936, the Dornakal church baptized 11,400 new converts, at an average rate of over 200 per week. This successful public ministry took place in the midst of rising Indian nationalism and an increasingly powerful Independence movement, which put pressure on the Indian Christian community to prove its indigenous character. Mohandas K. Gandhi’s swadeshi campaign for Indian economic self-reliance and his galvanizing calls for swaraj, or Indian Home Rule, influenced educated Indian Christian elites and progressive Western missionaries to accelerate a centuries-old campaign for church self-sufficiency brought to India by pietist Lutherans such as C. F. Schwartz and Anglo-American missionary statesmen Henry Venn and Rufus Anderson. Most Indian Christians, however, rejected the anti-British and anti-foreign aspects of nationalism and, where they desired church self-sufficiency and indigenization, they often realized it in wholly unexpected, uniquely local and, sometimes surprisingly Western ways. The great bishop and scholar Stephen Neill wrote, “It has always amused me that, whereas I the foreigner always went to Church barefoot, Azariah, the Indian, always wore leather shoes.” The British bishop had adopted the Indian custom, while the Indian bishop had adopted the Western custom. Such reversals were not too uncommon by the end of the British period. Dornakal Christians chose a Westerner, rather than an Indian, to succeed Azariah as Bishop of Dornakal, a move that greatly disappointed Western missionary indigenizers but satisfied local Christians eager for a mediator between rival Mala and Madiga caste groups. There was no simple way to indigenize within India’s complex society. Converts from across the subcontinent came from very different “Indias” and, additionally, these different “Indias” were in a constant process of change and redefinition. Azariah’s Tamil Nadar India was quite different from his Dornakal church’s Telugu Mala/Madiga India, and these Indias were, in turn, different from a multitude of others. The Madiga converts of his diocese were traditionally leather workers occupied in the tanning of skins and the making of leather articles. They had occupied the lowest status in society, and because their touch was considered to be polluting, they were prohibited from drawing water from common wells and from living in the main village. These Madiga village converts wished to leave this background behind through a change of religious identity, through education, and through new occupations. If indigenization and self-sufficiency implied the continuation of symbols and practices associated with the stigma and shame of their former social status, they were generally not interested. The Telugu church has developed a beautiful indigenous musical tradition, but its incorporation of local traditions into Christian worship and life has been highly selective. Azariah was named after the virtuous Old Testament king of Judah whose leprosy caused him to live apart from others (2 Kings 15:1–5), and the social stigmas associated with his own former caste identity were never far from his mind. Azariah politely resisted pressure from his mentor’s wife, Isabel Whitehead, to add a turban to his Episcopal attire when he was consecrated in 1912. To her, the turban was the consummate symbol of the dignified Orient and, hence, perfect garb for the first Indian bishop. To Azariah, it was an embarrassing reminder of either the rustic cloths that coolie workers wrapped around their heads for protection from the sun, or the more extravagant headgear of India’s princely, martial, or elitist Brahman—dominated traditional culture. Worse, the turban seemed old-fashioned to his generation, which now favored a more modern round cap. In the end, Azariah chose a simple Western cassock without the turban. It was surely surprising and probably frustrating to Western orientalist indigenizers to discover that Indian Christians had their own ideas about how to define their new identity, and that sometimes these indigenous solutions borrowed freely from Western idioms. In India, Christianity entered a highly fluid society, where boundaries and relations between different caste groups were routinely being challenged and redefined. Christianity played an essential role in the upward mobility of Azariah’s own previously semi-untouchable Shanar (later Nadar) caste as the missionaries and newly educated converts protected these people from persecution by Vellalar (high-caste) landlords eager to preserve a cheap and docile workforce. Christians defended Shanar women during the violent “breast-cloth controversy” in which Shanars challenged upper-caste requirements that Shanar women go unclothed above the waist. Christian schools provided access to better jobs, greater mobility, economic improvement, and higher social status. When Tirunelveli Christians such as Azariah’s father chose to build semi-gothic churches with towering steeples, they were turning their backs on the small, usually thatched shrines of their former faith, which were so representative of their poverty and social marginalization. The new Christian edifices were pukka (or proper) churches made of substantial stone (including stones from former shrines) and built deliberately on the sites of former shrines to symbolize their replacement. Converts took particular pleasure in building new church steeples higher than local Hindu temples. When Azariah himself later built a pukka cathedral in Indo-Saracenic style in Dornakal, one sees the emergence of an even more self-confident indigenous church willing to borrow freely from idioms of elite Hindu and Muslim architecture. The grassroots anti-beef-eating campaign complemented the Dornakal church’s teaching against alcoholism and other immoralities to challenge local forms of depressed class oppression. Visiting a village in 1936 whose Christians had been baptized eleven years before, Azariah discovered that their commitment to giving up “drink, beef, theft and lies” had so improved their “cleanliness” in the eyes of village landlords (zamindars) that distance requirements of their former untouchability had been abandoned. Abstention from defiling meats was a purely indigenous means by which formerly outcaste Christians succeeded in raising their social status. non-Christian villagers often joined the Christian anti-beef campaigns, but the church was clearly the driving force in this larger process of Telugu caste mobility. The Indian Anglicanism that emerged in Dornakal and elsewhere in the subcontinent provided a powerful means by which subordinate groups elevated their rank in the local social hierarchy by accommodating to and sometimes transforming the values of dominant, non-Christian groups. Using indigenous idioms, the church challenged local orders of rank and precedence with varying degrees of success. Susan Billington Harper is a writer and historian living in Villanova, Pennsylvania, and serves on the boards of the Association of American Rhodes Scholars and Eastern University. 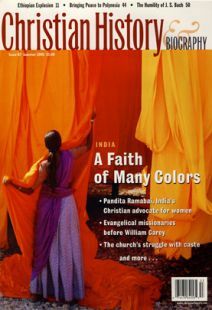 Conversions to Christianity in India have always been controversial, provoking protests and persecutions in their wake. Azariah frequently reminded his contemporaries that, when their depressed class forefathers converted, “their landlords and their masters placed every obstacle imaginable on their path. They were often deprived of their homes, their property, yet sometimes their own lives [were] threatened.” Western and indigenous missionaries alike habitually faced serious obstacles to their work on the subcontinent. Fresh controversies over conversion erupted in the 1930s, however, as British political reforms granted greater political power to Indians along religious lines. Christians, like Muslims and other religious minorities, were granted “separate electorates,” so that political participation was determined by religious affiliation and conversion therefore impacted electoral roles as much as church roles. Mass conversion movements of depressed class groups, which were occurring in Bishop Azariah’s Dornakal Diocese and elsewhere, now directly threatened Mohandas K. Gandhi’s “Children of God” bid to secure the allegiance of the untouchables within the political fold of his charismatically Hindu form of messianic nationalism. Gandhi sharpened his criticisms of Bishop Azariah and other missionaries in the mid 1930s, accusing them of using unfair methods and exaggerated claims about depressed class conversions. There were rumors that, in a private meeting with Azariah in 1937, Gandhi threatened to legislate against conversion in an independent India and to back up such legislation with state force. Such rumors further increased Indian Christian fears of the future. Toward the end of his life, Azariah predicted that the Indian church was entering a new period of difficulty. Since the coming of Independence, Christian missionary activity has, indeed, come under severe attack. The Niyogi Report of the State of Madhya Pradesh, published in 1956, recommended the passage of anti-conversion laws. So-called Freedom of Religion Acts of the 1960s further bolstered Hindu efforts to stop conversion. A Supreme Court ruling on January 17, 1977, defined the evangelist’s work as a threat to the “freedom of conscience” guaranteed to all citizens of India. The successful challenge of the Hindu Nationalist BJP party to Congress Party political dominance at the end of the 20th century, accompanied by growing anti-Christian propaganda of the R.S.S. and Sangh Parivar, have all placed Indian Christians in an increasingly awkward position in their homeland.